Samsung demonstrated its commitment for global mobile phone market, showcasing Samsung�s hero 3G and 2.5G handsets with the latest design and technology at CeBIT 2006. With the technology achievements of the world�s first 3.6Mbps HSDPA technology demonstration at CES in January and the introduction of Europe�s HSDPA phone at 3GSM, Samsung further enhances its leadership in 3G market with its powerful 3G model, the SGH-Z400 and reinforces its leadership 2.5G mobile phone market with the world�s slimmest slider, the SGH-D870 at CeBIT 2006. 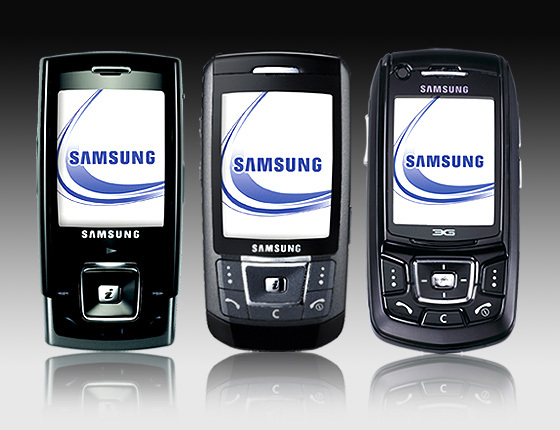 Samsung�s latest hero, the SGH-Z400 especially exudes in its rich features and elegant design. Samsung�s SGH-Z400 adopts the elegant slide-up form factor in a slim design. It supports all features of 3G such as video telephony and streaming and comes with a 2 Megapixel camera, document viewer, and an external memory slot in a sleek design that fits into one�s hand. It also supports document viewer, Bluetooth and TV-output function. All these rich features are packed in only 18.4mm thickness. With the SGH-Z400, users can now experience 3G mobiles in a compact and even slim design. The ultimate synthesis of business function and executive style, this new Samsung 3G slider is equipped with all the features that users demand. Samsung also showcased the fashion 3G slider, the SGH-Z550. Samsung�s SGH-Z550 is a slim, 3G mobile, elegance with its clean-cut and simple design. Samsung�s SGH-Z550 packs a two megapixel camera and 138MB embedded memory with an external memory slot in a slim case. With the ultimate slim slider, the SGH-D870, Samsung extends its mobile handset offering and strengthening its presence in the 2.5G handset market. Samsung�s SGH-D870 offers the latest in multimedia technology with premium slide-up design for business professionals. It comes in 13mm in thickness with slide-up design, the thinnest ever. It also comes with a 3.13 megapixel camera, opening the 3 megapixel camera phone trend for European mobile market this year. The SGH-D870 also has all of the business features such as an external microSD memory slot, document viewer, TV-output function, as well as Bluetooth stereo headset (A2DP) function to enhance the multimedia experience. Samsung also showcased the SGH-E900 GSM mobile.Samsung�s SGH-E900 comes with an elegant black design with innovative touch key for quick and easy control. This slide-up handset has been designed for simplicity and convenience. The SGH-E900�s intuitive dual interface, which automatically distinguishes music mode from talking mode, illuminates only the necessary buttons for simple navigation and limits accidental button-pushing. This tri-band handset with EDGE multimedia technology features a 2 megapixel camera with 4x flash for still photos, video recording and video messaging. Samsung�s new hero models for 3G and 2.5G not only look great, but include all of the latest multimedia and business must-have functionalities in a premium slim slide-up design. I am really at awe seeing the Samsung's camera's clarity, the BEST so far in camfones! It all started when they released their V200s in the past . . . so far, in the 2MP camfone arena, the Samsung D600 has shown the BEST camera-quality-image result, OUTBESTING the K750i/W800i/N70 etc. ! Very typical Samsung phones, these new series. They all look so alike. I was expecting something more exciting. I'm not disappointed though. No mention of the P300. Prob coz it aint released here yet. Well it's thinner than a razr, and as thin when in the supplied case which houses a second battery! I'm told it's not a bad little thing either. If you were wondering, my dad has bought me one! is the p300 the one that looks like an old school calculator?? @mutleyboy Yeah thats the one!